"The Time Bender Trilogy: Part 2" is the eighteenth comic issue and the second of The Time Bender Trilogy, which was released 28 July, 2004 in the US and 17 November, 2005 in the UK. Cubert searches for a way to save the earth. Leela has been sent to ancient Greek times and meets the author Homer who is about to sacrifice kittens to Zeus. Leela frees the kittens which causes a storm. Bender is in the town of Salem, Massachusetts and assembles himself together with a magnet and ends up singing folk songs which pleases the townspeople who introduce a fembot named Samantha. At a town meeting the mayor announces that there is a robot in the town and it must be burnt. 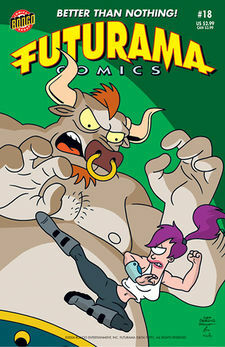 Fry is in 1915 and has to fight in Worlds War I against the Omicronians. Hermes, the messenger of the gods appears and tells Leela that she has angered the gods and he steals her time machine piece and the only way to get it back is to climb to the top of Mount Olympus. Bender is shown folk singing due to magnets. Cubert: Mmm... banana milkshakes were a great idea Asterisk! But right after these and maybe a cookie, it's back to saving the world. Despite the fact they are still fleeing the same dinosaur from the last issue, Linda has managed to switch from shreds of blue clothing to her normal outfit (minus the sleeves). This page was last edited on 6 December 2015, at 21:02.